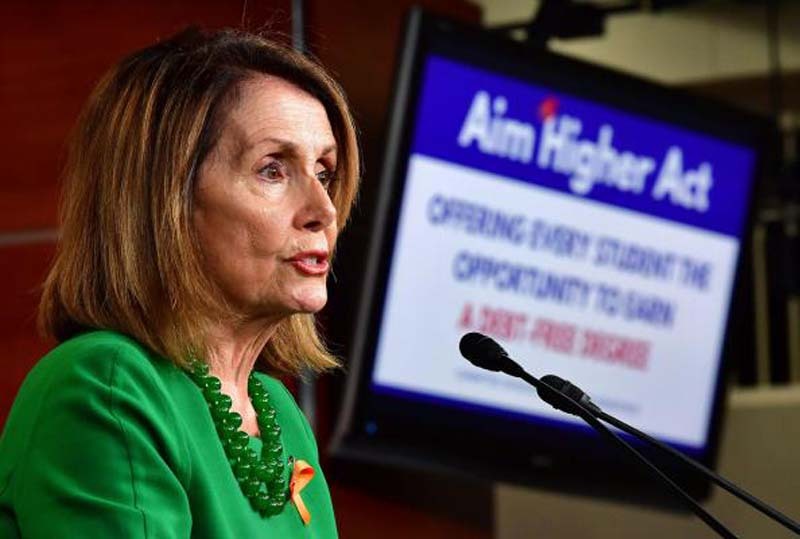 House Democrats unveiled a comprehensive reauthorization of the Higher Education Act Tuesday, seeking to decrease college debt and simplify financial aid. [post_ads]House Democratic Leader Nancy Pelosi, Rep. Bobby Scott, D-Va., and other Democrats presented the Aim Higher Act which is designed to "give every student the opportunity to earn a debt-free degree or credential that leads to a rewarding career," according to a summary of the bill. "The Aim Higher Act is a serious and comprehensive proposal to give every student the opportunity to earn a debt-free degree or credential," Scott said. "It provides immediate and long-term relief to students and parents struggling with the cost of college, it puts a greater focus on helping students graduate on time with a quality degree that leads to a rewarding career, and it cracks down on predatory for-profit colleges that peddle expensive, low-quality degrees at the expense of students and taxpayers." The bill seeks to reduce the cost of college by creating a federal-state partnership, requiring states to offer all students two years of tuition-free community college in exchange for federal funding. It would also expand federal aid to low-income families by increasing the Pell Grant award by $500 each award year and tying the Pell award to inflation. The Aim Higher Act would protect the Public Service Loan Forgiveness program, which provides student loan forgiveness to people in public-service professions, and would expand it to include individuals who work for Veteran Service Organizations and farmers. Another focus of the bill is protecting students, veterans and taxpayers from predatory for-profit colleges by increasing oversight and closing a loophole that allows for-profit colleges to count federal programs, such as the GI Bill, as non-federal dollars. "The opportunities for debt-free college that would be created by the #AimHigher Act aren't simply good for our students - they're good for our economy. Nothing brings more money to the Treasury like investing in Americans' education," Pelosi wrote on Twitter Tuesday. The bill is positioned as a counter to the Republican PROSPER Act, which the Congressional Budget Office said could cut nearly $15 billion in student aid if enacted.